Two years and a half years ago, Andrew McMahon released his first album under his new Wilderness moniker. 2014’s Andrew McMahon In The Wilderness signaled a new musical direction had he’d hinted at on his 2013 EP, The Pop Underground. His first band, Something Corporate, represented the piano side of the punk rock scene of the early 2000s. In his next band, Jack’s Mannequin, Andrew went into a more pop rock direction. His untimely diagnosis with Leukemia affected the Jack’s Mannequin project, and his follow up albums described the aftermath. 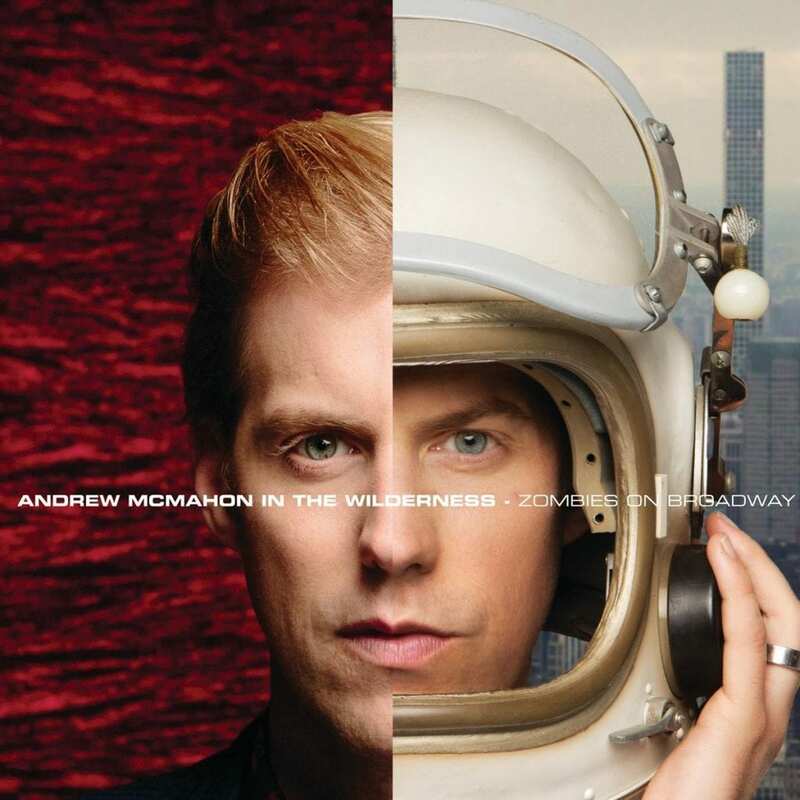 Now that Andrew McMahon In The Wilderness has taken flight and found radio success, Andrew is back with the second Wilderness album, Zombies On Broadway. Like Andrew McMahon In The Wilderness, Zombies On Broadway is a pop album. But this time, Andrew pushes it a step farther into new territory. It’s not as much of a concept album as some of Andrew’s previous records, but the songs are still cohesive. Instead of a linear story, this time around what we get is an overarching mood. Back in 2005, Jack’s Mannequin released their debut album, Everything In Transit. It was a very California album. As much as it described Andrew’s breakup with his high school sweetheart, it also painted a picture of California. Andrew recently revealed that his original intention had been to follow that up with a New York record. His plans got derailed when he battled Leukemia. Instead, his second album, The Glass Passenger, tackled his overcoming that cancer. Now that more than a decade has passed, Andrew has finally returned to that original idea. Zombies On Broadway is his long-awaited New York album. He recorded most of it in New York, though the city eventually got the best of him. He finished it in California. Zombies On Broadway doesn’t hit you with New York the way Everything In Transit did with California. He makes plenty of references to the Big Apple – see “Brooklyn, You’re Killing Me,” “Fire Escape,” and the albums’s title. The song that gave the album its name doesn’t appear here, much the way “Hey Hey Hey (We’re All Gonna Die)” gave The Glass Passenger its name, but didn’t come out until People & Things. Perhaps we’ll hear this album’s title track in the future. At first you may balk at the overtly pop sound on Zombies On Broadway. It’s a bit unexpected, though not unprecedented in Andrew’s back catalog. But listen to the album a few times, and you will find that the songs grow on you. The stand up amongst the best of his previous albums and EPs. Andrew explores new musical and lyrical territory here, but there’s enough of his familiar style that it feels grounded. The most surprising songs on the album are “Brooklyn, You’re Killing Me,” “Don’t Speak For Me (True),” and “Island Radio.” Andrew pushes into new music styles, speak-rapping verses one moment and gliding over an R&B groove the next. Vocally, “Shot Out Of A Cannon” is a pleasantly shocking display of Andrew’s upper register. Andrew offers up a lot of variety on Zombies On Broadway. He strikes a fine balance between new ideas and comfortable themes, inviting old fans along for the ride and new fans to the party. The result is a refreshing, fun album that is both honest and masterfully done. “Zombies Intro” – Andrew has said many times that Zombies On Broadway is meant to be his New York record, in many ways a counterpart to the California vibes of Everything In Transit. That urban east coast feeling is apparent immediately on the record. “Zombies Intro” puts the listener into the right headspace with its sounds of traffic, the kind of hustle and bustle New York City is known for. It’s only 27 seconds long, but sets the tone for the rest of Zombies On Broadway. “Brooklyn, You’re Killing Me” – The first real song on the album was also our first promo track after the lead single, “Fire Escape.” “Brooklyn, You’re Killing Me” starts with percussion and quickly spoken lines. The spoken aspect will likely remind longtime fans of an Everything In Transit track, “I’m Ready,” in which he rants about his right to wear dirty shirts. But here, Andrew’s lines come out as more of a stream-of-consciousness rambling. He only truly sings on the choruses, screaming out “you’re killing me” with lighthearted “la la”s in the background. It’s a different sound for Andrew, but the song grows on you with each listen. “So Close” – The third promo single – and first of 2017 – was “So Close.” It’s the most full pop song we’ve heard from Andrew yet. While the verses and pre-choruses sound familiar enough, the choruses go into pure dance mode, Andrew straining his voice as he sings the title. “So Close” feels new and refreshing. It sounds like it was made for radio, and would do well as a single. “Don’t Speak For Me (True)” – Andrew originally wrote “Don’t Speak For Me (True)” with and for another artist, a young singer named Ryan Beatty. When Ryan ended up not using the song, Andrew decided to give it a shot. Fans first heard the song a few weeks ago when it was shared as the final promo track. “Don’t Speak For Me (True)” is the most pop song yet, with a slick chorus that has an R&B influence. “Fire Escape” – Andrew began performing “Fire Escape” live last summer, and it was no surprise when it was released as the official lead single last September. This song truly captures the New York vibe Andrew was going for, describing a fast-paced night in the city and all the crazy shenanigans you can get into. “Fire Escape” is fun, bombastic, and offers a crashing chorus that sticks in your head. It’s a worthy first single and a highlight on the album. “Shot Out Of A Cannon” – Here’s another surprising, radio-friendly song. The verses sound like classic Andrew, but the chorus sneaks up and takes the song to new highs. “Shot Out Of A Cannon” is perhaps the best use of Andrew’s falsetto that we’ve heard from him; the melody is also infectious. As unexpected as the song may be, it’s also one of the best on the album. It could make a good future single. “Walking In My Sleep” – Fans got to hear “Walking In My Sleep” back in November when Andrew released it as the second promo track, following “Brooklyn, You’re Killing Me.” Andrew cites it as one of his personal favorites. Out of all the songs on Zombies On Broadway, “Walking In My Sleep” sounds the most like a late Jack’s Mannequin song. It would have been right at home on their final album, People & Things. The song doesn’t present much that’s new, but it does offer some warm familiarity. “Island Radio” – The strangest song on Zombies On Broadway is “Island Radio”. The verses are a bit awkward, in part because of distracting background buzzing. The choruses are stronger, and this is where the island feel kicks in. The lyrics and melody are good, but the song may have sounded better with different music. “Island Radio” may need to grow on you. “Love And Great Buildings” – Only two songs on the album were written by Andrew McMahon alone, and “Love And Great Buildings” is one of them. His writing style is clear, as this song sounds more familiar than most of the other tracks up to this point. It sounds like the best songs from People & Things, and the “hey hey hey” in the bridge certainly recalls “Hey Hey Hey (We’re All Gonna Die).” On the other hand, Andrew also explores a new lyrical theme in constructing a metaphor that compares the power of love with the strength of modern buildings. “Birthday Song” – Zombies On Broadway closes with the best song on the album. Like the previous track, Andrew wrote “Birthday Song” alone. The simple, piano-driven song is the most similar to his previous work. It’s also the most personal, serious, and touching song on the record. Andrew may have too much fun sometimes (see “Fire Escape” and “Island Radio”), and his wild lifestyle is catching up to him. It doesn’t jive with being a husband and a father, and this serious talk is emotional and powerful. After a silent gap following the song’s end, the track plays out 30 more seconds of urban traffic noise. It’s the perfect way to bookend the record, and it harkens back to the closing tracks on Everything In Transit and The Glass Passenger. You can buy Zombies On Broadway on iTunes now.